Leather is popularly used for clothes, jackets, accessories and shoes but as it’s rather expensive, it should be maintained well to increase it’s lifespan. Of the lot, it is your leather boots which is exposed most to the harsh outside elements and is prone to getting dampened by moisture to lose its overall durability. Is waterproofing boots really necessary? Besides its regular maintenance, you need to waterproof your boots to increase its life. This is important as leather does not hold up well when exposed to moisture. Water strips the leather of its natural oils and chemicals which give it its soft and durable characteristics. Water destroys your boots’ leather which is animal skin and made of fat and proteins which retain some moisture after tanning. While its crisscrossing fibers give leather its unique strength, it also makes it susceptible to drying and cracking if not treated with care. You thus have to minimize its exposure to water, moisture, acids and alkaline which can permanently damage leather. Moreover, salt and some chemicals can stain leather and are difficult to remove once they permeate leather. If left untreated, it not only discolors, but also weakens the top layers and damages the leather finish. Not only does waterproofing boots help extend the boots’ life, it also makes them more comfortable. However waterproofing leather boots is not a one-time affair; it has to be done periodically as waterproofing products wear off with time and exposure to the outdoors. It’s not exactly possible to keep water completely out of your boots as you never know when the weather will turn for the worse. However you can at least provide some short-term protection by waterproofing them with something like waterproofing spray for boots. You should start by removing the shoelaces and cleaning the boots. If the boots are new, just clean with a soft and dry cloth to remove dust. If it’s old, use a leather soap to strip off old layers of waterproofing and clean with a moist cloth. Let the boots completely dry before waterproofing them. Do not place water or any chemicals on the cloth while cleaning the leather. Boots are typically made of thick leather where color is not important. However if you want to retain the boots’ color, you need to perform a patch test to ensure the color does not change during the waterproofing process. Do this by applying a small patch of waterproofing product to some discrete part of the boots like the side of the shoe’s tongue under the laces. Then if you are happy with the results, move to another area like the inner back of the shoe to test again. Check after a few hours and if you are satisfied, you can continue and waterproof the entire shoe. Don’t assume that just because the waterproofing compound manufacturer claims it will not affect the boots color it won’t. There’s always an exception to the rule, and you don’t want to be it! The one and main difference between waterproofing boots and shining your boots is that you should pay attention to ensure you provide an unbroken seal to your boots. While it’s possible to shine your boots on occasion, in case of waterproofing, you need to ensure a water tight barrier is formed for complete waterproofing of boots. What waterproofing compound should I use? There are lots of waterproofing compounds for you to choose from, and many methods and techniques to use. 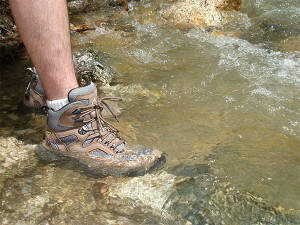 It’s up to you to choose and decide the best boot waterproofing option based on your boots and waterproofing needs. Wax-based polishes not only creates a thin protective layer for resistance from water and salt, but also gives the boots a shine. If this is your option, you need to consistently apply it for every few wears or if it’s wet weather and you plan to wear your boots. Specialty waterproof compounds protect your boots when applied properly, and come with a longer sticking period than polishes. However as they do not create a shine,but only seals out moisture, the boots have to be polished once the seal is set. Waterproofing sprays for boots. Many people are not happy with this option as they think that it doesn’t let the leather breathe and if it contains silicone, it will dry out leather. However if you are looking for something easy to use to waterproof your boots, then it’s better using this spray. Sprays have to be used liberally as they tend to lose their effectiveness after a few wears. They do not penetrate the leather but only form a protective layer on top of it. However they are less likely to change the boots’ color or create a layer of buildup. The spray has to be held about half a foot from the boots when using it, and sprayed evenly across the material. Once done, let the boots dry completely before using. There are also creams and oils like beeswax which is rubbed into the boots with a soft, clean and dry cloth and let to sit for an hour before the excess is wiped off. Creams not only provide a thick, waterproof barrier, but also conditions the leather. If you use oils, place a large amount of the oil on a clean cloth and apply directly to the boots and work into the material. It’s important you remain balanced while doing this as all areas should be coated and worked evenly. Then take another soft, dry cloth and wipe off the excess and you can use your boots within 24 hours. Leather is a highly permeable material and soaks oil well. However not all oils nourish leather or make it supple. Only mink oil has been proven to preserve both finished and unfinished leather by making leather boots water resistant and flexible while adding to its luster and longevity. Mink oil is compatible with leather as it has lots in common with organic leather’s inherent oils. Mink oil can be used in most types of leather except suede for conditioning, preserving, waterproofing and weatherproofing against salt, mildew, mold, etc. How to use mink oil on leather boots? 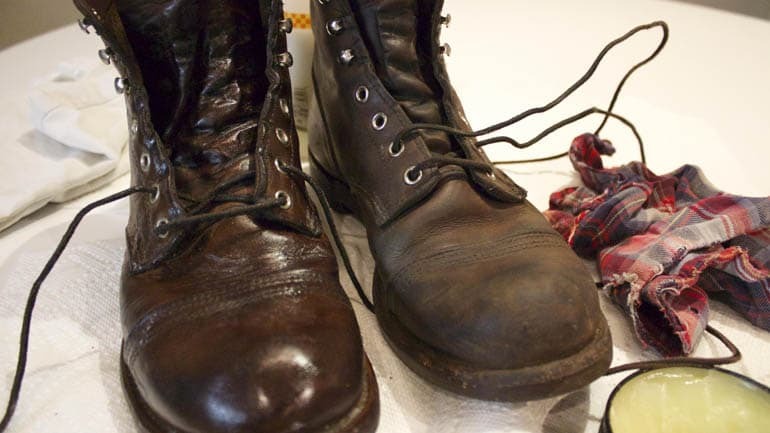 Use a clean and dry cloth to first clean your boots and then take a sparing amount of the oil and apply evenly on the leather. Wait till the oil penetrates and gently wipe off the excess oil. As mink oil tends to darken the leather color, its best used on dark leather toned boots. Regular oiling of boots with mink oil helps protect them from external abrasions from water, salt, snow etc. to help maintain your boots so that you can confidently and proudly walk out in your boots on sunny and snowy days. Remember, cleaning and waterproofing boots is a skill to be proud of as a pair of well-cared boots prove that you are a patient and disciplined person. It’s not easy maintaining leather boots, and the fact that your boots are so well maintained and waterproofed shows how committed you are at maintaining your things. This thus gives you another valid reason for weatherproofing leather boots!